Bernard McWilliams’ career as a performer and teacher of the viola has been varied and productive. Early on, he served as principal violist of the Carmel Bach Festival Orchestra prior to becoming a member of the US Army Strolling Strings, based in Washington, DC. As a dedicated chamber music aficionado, Dr. McWilliams’ performances have ranged from a cultural exchange in the former Soviet Union to serving as the resident violist in several university faculty quartets. 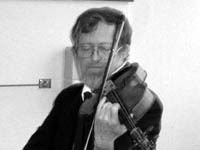 Dr. McWilliams is a past president of the North Carolina String Teachers Association. His publications include arrangements of Mozart and Haydn Sonatas for viola and piano, and transcriptions of Russian, Irish and Scottish folk songs for quartets and quintets. Since “officially” retiring, Dr. McWilliams has maintained a full violin/viola private studio. A recent move to Wilmington, NC, presents new opportunities for performance, for building a new class of budding violinists and violists, and for enjoying the cultural presentations of a more metropolitan area (the beaches are nice too! ).